This is a fun and effective project to do. Use only the leaf charms or add your favourite pearls or crystals for added interest, and you have a unique bracelet to wear or give as a gift to someone special. You will need a few things to make this charming bracelet. A long sharp blade such as the Stanley blade shown. 2 pairs of pliers and a side cutter. Condition half a block of each colour clay and the whole block of black clay by thoroughly kneading the clay until it is warm and pliable. Filani polymer clay reacts well to pressure, so I find it simpler to cut the amount of clay I need, place it on my work tile and roll across it several times with my roller to get the clay particles moving. Once it starts feeling pliable, the rest of the conditioning gets done by hand. 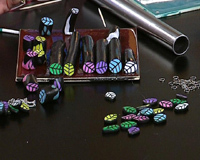 Using the leaf cane tutorial in the members section of the Filani website –http://www.polymerclay.co.za – create a number of different coloured leaf canes. The black clay forms the veins and surround of the leaves. Set the canes aside on a piece of wax wrap to rest. Any leftover canes can be stored well wrapped in cling wrap. Do not store the canes wrapped in wax paper as that will leach the oils from the clay, leaving them hard and brittle. If the canes are very warm you can cool them down in the refrigerator for a few minutes. Take a piece of scrap clay and form it into a thick log about the length of your thumb. It doesn’t matter if the colours are all mixed. The clay won’t be baked and can be re-used at any stage. This bit of scrap clay gets used to create a supporting channel to support the shape of the canes when cutting them. Use the ball tool (or a thick paint brush) and press a groove into the clay. Roll it back and forth slightly to create a channel. Lightly mist this scrap channel with water (I use a spray bottle of water). This stops the cane sticking to the raw clay of the supporting channel when you’re cutting. Place the cane into the scrap channel. Make sure it’s facing towards you and is close to the edge of your tile and work surface. Use the Stanley blade to take 3mm thick slices off the cane. Cutting the canes can be tricky – we tend to tilt the blade and pull it towards ourselves. It’s important to be able to see over the top of the cane when you cut it. Position the blade so that when you look over the top of your work, the blade is vertical to the work surface. Cut through the cane and the scrap clay. Clean the blade before taking the next slice. This removes any lint which may attach itself to the blade and cause drag marks in the surface of your cane slice. Slice as many leaves as you may need for your bracelet. The scrap clay can be reformed into a log as many times as you need. Just be sure to blot the water off with a paper towel before reforming the next log, and spray with water each time you need to place another cane in the supporting channel. The cut slices come away cleanly from the supporting clay, without any distortion to the shape of the cane. Make a hole in each leaf charm using a toothpick. Remember that jump rings are quite thick, so I pierce the charm first from one side, then flip over and pierce it through again from the other side. The hole should be about 1.5mm in diameter. Don’t make the holes too close to the edge, otherwise the leaf may crack. The jump rings you use should be fairly large – mine are about 5 or 6 mm in diameter. Place the cane slices on a sheet of computer paper on a ceramic tile. Baking on paper stops the slices from getting shiny spots on the side that touches the tile or baking surface. I like using a tile because it can take the heat from the oven without damage. Bake the slices at 130 deg. C for 15 to 20 minutes. Make sure you preheat the oven and that the temperature is stable. Switch off and allow the leaves to cool slightly, then remove them from the oven. Always check the packaging of your clay to make sure of the manufacturer’s recommended baking temperatures and time. 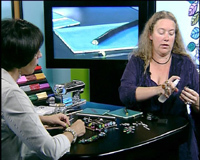 Allow the cane slices to cool completely before assembling the bracelet. 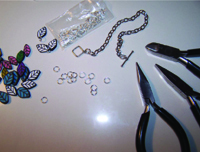 You will need: The pre-made charm bracelet, jump rings, pliers and side cutters, your leaf charms and any accent beads you may wish to include. Make sure that the chain is not too long for your wrist – shorten it if necessary. motion to close the jump ring. Continue adding charms into each link of the chain. Vary the colours and add accent beads if you want. Wear and enjoy!